This week we brought out a joint press release and published it across Europe. 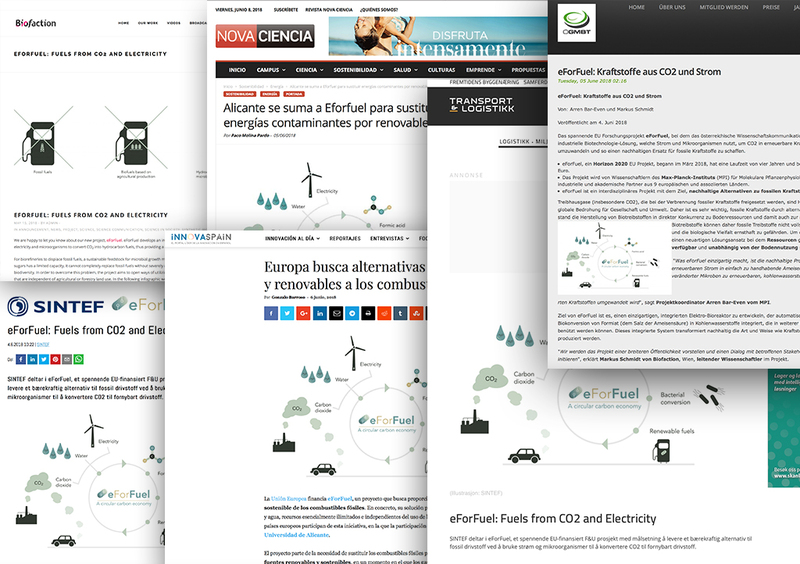 Each research partner adapted it, and highlighted their role and work within the project, so have a look at the general text, and then scroll to the bottom to check out the press release in multiple languages. eForFuel is an exciting EU-funded research and innovation initiative that seeks to provide a sustainable replacement of fossil fuels byusing electricity and microorganisms to convert CO2 into renewable fuels. Greenhouse gases (especially CO2) emitted from the burning of fossil fuels are significant drivers of climate change and a global threat to society and the environment. Hence, it is very important to replace fossil fuels with alternative, sustainable sources. Early generation biofuels compete with land resources, limit agricultural production of food, and, therefore, cannot completely replace fossil fuels without severely undermining food security and decreasing biodiversity. In order to overcome this problem, eForFuel provides a novel solution to utilize resources that are essentially unlimited and that are independent of land use: CO2, electricity and water.”What makes eForFuel unique is the sustainable production chain that converts CO2 emissions and renewable electricity into easy to handle formic acid, which is then fed to engineered microbes for the production of renewable hydrocarbon fuels“, says project coordinator Arren Bar-Even from MPI.eForFuel aims to establish and demonstrate a unique integrated electro-bioreactor, which automatically integrates CO2 electro-reduction, formate production and formate bioconversion to hydrocarbons that can serve as “drop-in” fuels. This integrated system will serve as a stepping stone towards transforming the way we produce fuels and carbon-based chemicals.